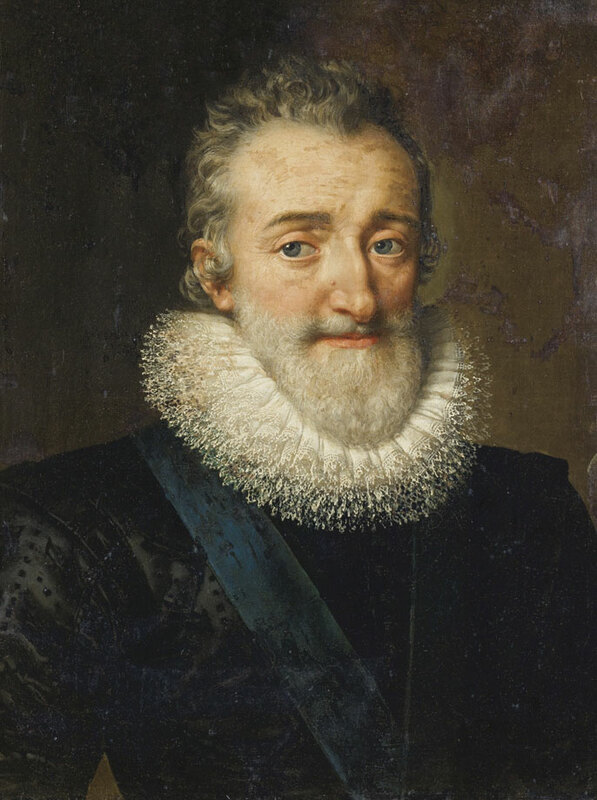 The French King Henry IV (1553-1610), the first of the Bourbons, is considered a great connoisseur of the French kings and was also a very special wine lover (in some sources he is dubbed "drunkard"). There are innumerable events about him and, in part, legendary tales in the context of wine. Henry IV was baptized Roman Catholic, but changed faith several times. As King Henry of Navarra he was a Huguenot (Protestant) leader. After lengthy struggles with the French Catholics, he stood as a French king for discussion, but was not recognized by the Catholic League. Therefore, in 1593 he converted again to Catholicism. He described his conversion as a "dangerous leap" (le saut périlleux). In this context, his saying "Paris is worth a fair" (Paris vaut bien une messe) was later given to him by the Protestants. He also introduced the "Carabiniers du Roi", the predecessors of the musketeers as the king's bodyguard. It did not help him, because he was murdered by a Catholic fanatic (that incidentally was the 18th assassination attempt on him). Henry IV possessed among other things vineyards in the Champagne, It is said that he is titled "Lord of the Vineyards of Aÿ "Preferred all others to whom he was entitled as ruler of France. In the course of the religious wars, he besieged Paris, but in between mercifully announced a truce, so that the inhabitants of their vintage could hold. The Burgundian winemakers of the Burgundian community Givry (Area Côte Chalonnaise) proudly claim that the king's mouthwatering red wine was the best before any other in France. His lover Gabriele d'Estrées owned a vineyard, which is why he had good reasons to visit frequently. Near Chavignol near Sancerre in the Loire Valley He personally planted a tree that is said to still stand today. He called the wine of this place the best he had ever tasted, and if all the people in his kingdom were to drink it, all religious wars would come to an end. The Sancerre is going out Sauvignon Blanc and he was allegedly because of this variety the great wine connoisseur. For his grandfather is said to have rubbed his lips with a clove of garlic after birth and instilled in him a tiny sip of wine. His father Anton von Bourbon (1518-1562) took the baptism with a sweet Jurançon by moistening his lips with it. To his abundantly enjoyed favorite wines also counted some of the areas Lirac and Orléanais, In order to limit the excessive consumption of the king, his physician and adviser Joseph du Chesne (1544-1609) wrote in 1606 in his "Treatise on the health "The following: The wines of Coussy and d'Hay and similar wines have been found even better than those of Orleans who are smoky and a headache cause. Therefore, all the head waiter of the king is sworn to serve at their receptions the wine no wine of Orléans, even if it is quite good wine. Allegedly, the Italian grape Doux d'Henry named after him. The legendary background of the naming was that at a meeting with the Italian monarch Charles Emanuel I (1562-1630) at the beginning of the 17th Century, a sweet wine made from it was served and praised by him. Incidentally, he was a regular guest of the famous restaurant that still exists today La Tour d'Argent in Paris, in its historic wine cellar store 450,000 bottles of wine today. This page was last modified at 19 May 2018 at 16:25.